Splinter shields are available to protect the user when testing brittle samples which are liable to fragment. Splinter shields for use with materials testing machines are available to protect the user when testing brittle samples which are liable to fragment. The shields help prevent sample splinters from leaving the test area when performing a test. Shields for dual column test stands (both bench and floor) are fully hinged and can be easily opened, allowing full access to the test area from the front or back of the machine. 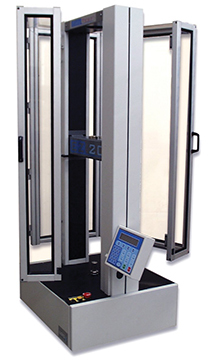 The machine automatically detects whether the doors are open or closed, ensuring the shield is always securely closed before it will perform. - Sliding splinter shields move in the vertical axis of the machine column and can be easily lowered to safely enclose the test area once the sample is positioned. - Hinged splinter shields are available in a range of sizes and can be fitted to enclose either the test area or the entire machine.